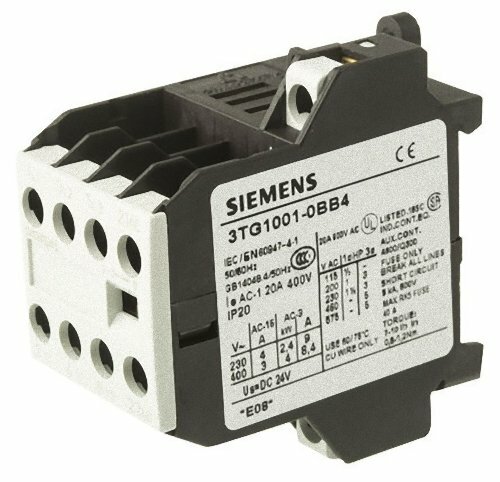 The 3TG10 contactors with 4 main contacts are available with screw-type terminals or with 6.3 mm to 0.8 mm tab connectors. The designs with screw-type terminals are suitable for use in any climate and safe from touch to DIN VDE 0106 Part 100. The 3TG10 contactors have a compact design. Their overall width is 36 mm.. They are suitable for use in household appliances as well as for distribution boards in offices and residential buildings, owing to their hum-free construction. They can further be used in all areas where there is only a limited amount of space available, e.g. in air conditioners, heating systems, pumps and fans - basically in all simple electrical controls.